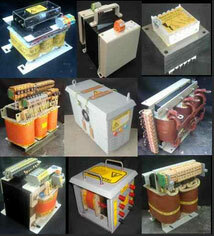 We are leading manufacturer and exporter of optimum quality industrial transformers and chokes. These are known for its unique attributes like long functional life, high performance, overload capacity and excellent voltage regulation. With 19 years of experience in the realm, we have been offering high quality transformers and chokes like Control Transformers (1 Phase & 3 Phase - 5VA to 10 VA), Custom-Designed Transformers (50 VA to 150kVA Dry Type Only), marked Transformers for Panel Builders upto 40kVA, Transformers & Chokes for Textile Machineries, Transformer for CNC Machines & Elevators, DC Filter & Custom Designed Chokes, Energy Efficient Transformers. Fabricated using finest quality Electrical Steel Laminations and Copper Wires Terminal Blocks, our range finds application in Textile Machineries, Passenger Elevator, Control panels, Machine Tools. Designed in compliance with EN 61558 Standards, our range is widely catered to Our clients based in Germany, United Kingdom, Sri Lanka, Uzbekistan, Middle East.